What Are The Greeks Up To For New Year’s? On New Year’s, Greeks will be partying and enjoying fireworks, along with the rest of the world. But, also like the rest of the world, they will partake in some local, age-old traditions as well. In some Christian denominations, including the Greek Orthodox, January 1st is the Feast of the Circumcision of Jesus. According to Jewish tradition, male babies are circumcised 8 days after birth. The day is honored as Jesus’ first sacrifice for human kind. January 1st is also celebrated as the anniversary of the death of St. Vasilios (Basil), an early church father remembered for his generosity, especially to the poor. Holiday gifts are traditionally exchanged on New Year’s Eve or New Year’s Day, rather than the 24th or 25th of December and it’s St. Vasilios who brings gifts for children instead of St. Nicolas. St. Nick does get a nod though. His feast day on December 6 opens the Christmas season, which ends with the Feast of Epiphany on January 6. The 12 days of Christmas begin with the birth of Jesus on December 25 and end with the visit of the Magi on January 6th. So, while many Americans close the holiday season on January 2nd, Greece remains in the thick of it for a few more days. On New Year’s Eve, it’s traditional for family and friends to gather for a big meal and stay up waiting for the New Year and St. Vasilios to arrive. They might pass the time playing games of chance, this being a particularly lucky day. An onion is hung on the door overnight as a symbol of renewal. Once the New Year rings in, a pomegranate, symbol of prosperity, is smashed on the doorstep before entering the house the 1st time. The Vasilopita is a traditional cake baked with a coin inside. 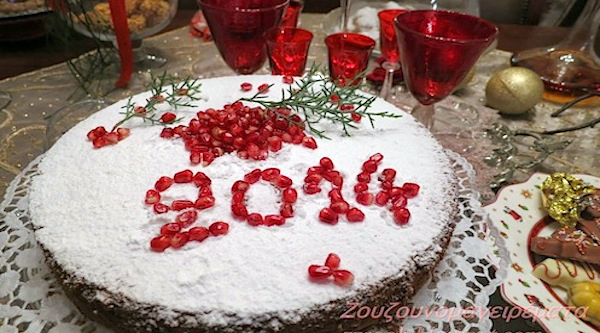 On New Year’s Day, the cake is served and whoever finds the coin in their cake can look forward to a lucky year. Cheers to all and best wishes for a healthy, prosperous and peaceful 2015! This entry was posted in Food & Drink, Greece, Holidays & Festivals, Uncategorized and tagged feast of the circumcision, Greece, Greek, new year's eve, new years, vassilopita by yalla2013. Bookmark the permalink.